Borken is a small town north of D�sseldorf. 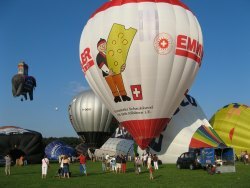 Conveniently a balloon festival is hosted there around the same time as the Metz Balloon Festival, and a tradition has been established for the syndicate to visit both events. The Borken meet is nowhere near as grand in scale as the Metz meet, but presents its own set of challenges in terms of lots of obstacles such as forests, windfarms, pig farms and equestrian centres to avoid. The latter are very important, pigs can be easily panicked by the high pitched whistle from the burner, and horses are spooked by balloons. A careless balloon can cause many thousands of pounds worth of damage when passing too close to a stud farm. Having said that, amazingly the Borken launch area is right next to an equestrian centre, and the horses there are unperturbed by the balloons. This anomaly can only be put down to them being used to balloon launches. 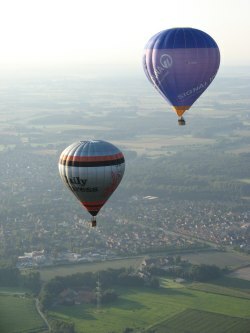 Balloonists haven't got a great deal of control over the direction of their balloon (apart from using wind sheer at different altitudes), but can climb to higher altitudes to avoid such problem areas. Indeed balloonists use maps with problem areas marked out showing the altitude they should exceed when flying over such areas. The team are essentially the same as in Metz, though Alex had to get back to the UK. 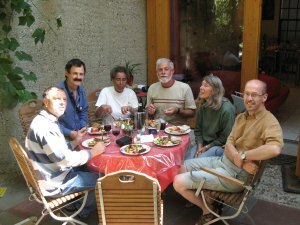 An important part of ballooning is the social side, so here we are again enjoying another meal. Clockwise, from left to right: Kevin Dodman, Tony Gould, Liz Rowan, John and Frances Lister and Niall Rowan. Again yours truly is taking the photograph. Crusader (Daily Express logo) over the German countryside. As mentioned earlier. the landscape in this locality has a spattering of wind turbines, power cables and an extensive amount of patchwork forest cover. The latter can be quite daunting if it stretches for many miles and fuel is getting short. Yet at the same time it is an exhilarating challenge to skim along the top branches of the trees. Borken seems to attract the unusual balloon shapes, which tend to be sponsors' balloons and a lot of these will put on display at launch, but once out of sight from the launch field, usually tend to land early. Pilots of sponsored balloons can have a hard time of it; they are under constant pressure from their sponsors to launch, meaning they tend to take more risks. 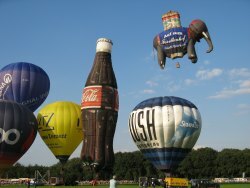 Balloon meets normally feature a night glow, where a line of tethered balloons will entertain spectators by turning their burners on and off in preset sequences synchronised with background music, effectively producing a light show. 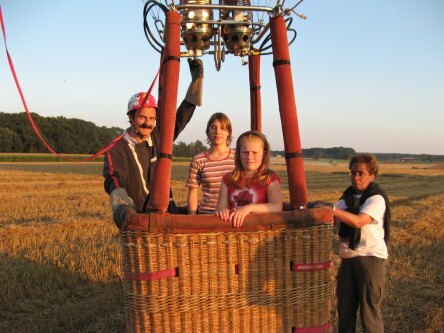 Balloonists try to foster good relations with the public. 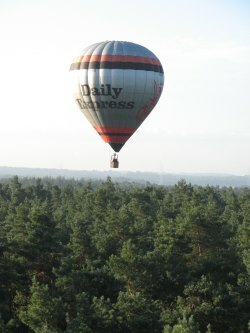 As an example we took the family who owned the property we stayed in at Borken for short trips in one of the balloons. When members of the public are close at hand when we land, if possible, we will try and give them a short hop across a field, particularly children if their families approve. 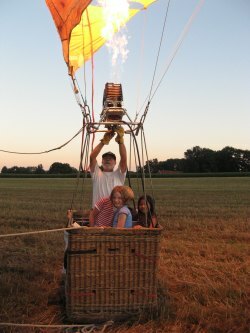 Tony and Liz had done an evening flight with me as retrieve, and had a perfect, gentle landing near a German family. Here a couple of the girls who watched the landing are about to enjoy a short flight over a field. 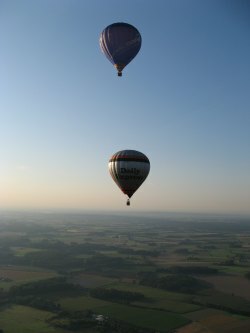 John and I took a balloon up on the last flight of the meet. A nice guy John with a wealth of ballooning experience. He regaled us with stories of his flights at the biggest balloon meet of them all: Albuquerque, New Mexico. The wind conditions on this final flight were such that we managed to get across to Holland for a landing. Kevin, who was retrieving for us, was green with envy that we had achieved this. It was only after landing and were greeted by the local farmer and children that we realised that we had actually crossed the border. Thankfully restrictions on border crossing were not as strict as they used to be a few years earlier. In the picture we have John giving the farmer's children a joy ride. Off shot is the anxious farmer holding on to the rope attached to the basket to ensure his children don't disappear over the horizon. There was an amusing (though it could have resulted in a disastrous ending) incident at the Borken meet a couple of years earlier. A couple of the guys were flying when the weather took a sudden turn for the worse. The meteorological reports had not anticipated a sudden stormy front. The skies turned very dark in a short period of time, and lightning was around. Now lightning and hot air balloons do not go together, and it is imperative that the balloon lands immediately. So the chaps were forced to do an emergency landing. They actually landed in a back garden in Borken. The basket landed on top of a circular washing line and completely flattened it into the ground. The balloon envelope gift wrapped the bungalow. In the lengthy process of unwrapping the envelope, a couple of roof tiles got damaged, but other than that there was no real damage apart from the washing line and a little pride. The police had to be called in of course, but they just made a report and that was the end of it as far as they were concerned. I think it might have got as far as the local press. The balloon envelope did receive a tear or two; no problem to Tony once back at the accommodation, he simply got out his sewing machine and stitched it back together again. All in a day's ballooning.